Drinks before noon, yes please. It only took me 4 years to get on the Mad Men band wagon and now I can’t get enough. It seems the decor of the 60’s is starting to infect my current decorating style. 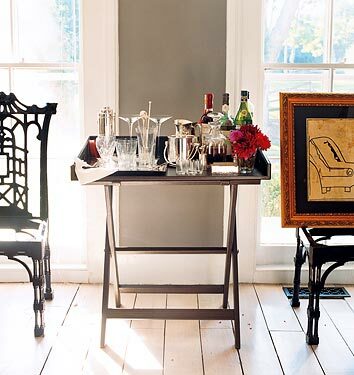 Maybe it is the economy and people have to downsize on space, but I have been noticing the bar carts having a big comeback. The best part is they work into any home style: vintage, modern, country, outdoor, etc. With a bar like this is seems completely appropriate to have a drink at any time of the day, especially if it’s with Don Drapper.